When standardized tests are used to assess student attainment of basic skills, "direct of explicit instruction models most often produce the highest student scores" (Huitt, Monetti, & Hummel, 2009, in Reigeluth & Carr-Chellman). In order for direct instruction to be successful, only students who demonstrated mastery of prerequisite knowledge should be allowed to receive instruction which builds upon the prerequisite knowledge. "Essential content should be taught to students via an active presentation of information" (Huitt, Monetti, & Hummel, 2009 in Reigeluth & Carr-Chellman, p. 79). Bloom (1981) stated that teachers should provide a clear organization of the presentation with step-by-step progression from subtopic to subtopic based on prerequisite knowledge and skills. Pretesting or prompting of relevant knowledge (Block, 1971). More student-teacher interaction (Walberg, 1991). The use of many examples, visual prompts, and demonstrations to mediate between concrete and abstract concepts (Gage & Berliner, 1998). A constant assessment of student understanding before, during, and after the lesson (Brophy & Good, 1986). Review. It is important to have students activate prior knowledge so that they can more easily establish links to new information (called elaboration by information processing theorists such as Craik & Lockhart, 1972). What. Describe what is to be learned in the lesson. Teachers should state objectives and how the student is to be held accountable for the learning activity (Gronlund, 2003; Mager, 1997). Perkins (1992) maintains that clarity of content is one of the most important conditions for quality instruction. This clarity should include what is to be learned and the standards for mastery. Why. Describe why a particular objective is important for students to master. Ultimately it is important that students have a personal reason to be engaged in the learning process. Component relationships-the lesson could be organized from parts to whole (inductive) or from whole to parts (deductive). Research suggests a rule-example-rule approach as an effective means to teach concepts to students (Van Patten, Chao, & Reigeluth, 1986). Relevance relationships-Organizing content based on logical or empirical relationships among factors or categories within the lesson that are not hierarchically organized. Sequential relationships-Organizing a lesson in terms of a step-by-step sequence. Transitional relationships-Organizing a lesson in terms of the movement or transformation from one phase to another in the content being taught. Additionally, teachers should use many examples, visual aids, and demonstrations in their presentation to enhance the effectiveness and efficiency in instruction. Probe and Respond. Probe students regarding their initial understandings. These are formative assessment activities and should be quick, short explanations of students knowledge or skills that inform the teacher if students are acquiring the concepts being presented. Teachers need to make instructionally effective use of wait-time, defined as the interval between a teacher probe and student response (wait-time I) or the interval between the student response and the teacher response (wait-time II). Rowe (1974a, 1974b) found that increasing either led to increased achievement, with increases in both having a compound effect. Fagan, Hassler, and Szabo (1981) found that using both higher-order questions and increased wait-time had greater impact than using either separately. Perkins (1992) suggested that providing learners with numerous opportunities to practice the skills being learned is a critical activity for student learning. Guided Practice. Students practice the newly learned knowledge or skills under the teacher's direct supervision (Walberg, 1999). At this point in the lesson, the teacher must actively monitor student activity while providing immediate feedback. At the end of this method, teachers should have rather precise information regarding each student's knowledge or skill with respect to the lesson objective(s). Independent Practice. Student practice the new concepts independently. This may be done in the classroom or at home. While there has been some research that homework is relatively less important for elementary students, the vast majority of research supports the positive effects of homework for for middle and high school students. Most importantly homework must be be completed and graded if it is to be effective. It seems obvious that if the instructional day can be increased, thereby giving students more engaged time, then student achievement will increase. Periodic Review. This method can be incorporated into teacher probes, guided practice, and independent practice. Teachers would be well served, when designing instruction, to make sure students have opportunities to revisit material learned a week, a month, or even a year previously. While cognitive research has shown that once material is in long-term memory it is there permanently (Atkinson & Shiffrin, 1968), students need practice retrieving that information and using it appropriately. This is an excellent place in the lesson to use cooperative learning techniques. Assessment and evaluation involves collecting data and making decisions about end-of-lesson or end-of-unit assessments. Formative Assessment. Teachers make formative evaluation decisions about students on a daily basis to determine if they are making progress. Data from the previous methods of probing and responding, guided and independent practice, and periodic review activities might be used. The primary function of this evaluation process is to make plans for additional teaching on the topic, if necessary. Walberg (1999) asserts that additional teaching should occur when students perform at less than a 90% level during guided and independent practice exercises. Summative Assessment. Teachers gather summative assessment data to see if students have mastered the required concepts and skills. This usually is in the form of unit tests or projects covering material from a week or two of instruction. Other types of summative evaluation may include semester or annual exams. It is important that summative evaluations match the content, form, and standards of external audits of classroom learning. Teachers should know the expectations of standardized tests, the requirements of any related courses students might take in the future, and requirements for future employment. There are two important instructional methods that should occur throughout the lesson on an "as needed" basis: providing cues and prompts, and providing corrective feedback and reinforcement. Cues and Prompts. Providing cues and prompts, is often used when teachers review previous material, ask questions or probes, or have students engage in guided practice. The use of cues to hint at important information or indicate lesson transitions and the use of prompts when having students demonstrate the initial understanding of during guided practice are important instructional activities. When a student is in what Vygotsky (1978) called the zone of Proximal Development, the student will sometimes need a cue or prompt in order to be able to recall the required information or demonstrate the desired skill. However, when no amount of prompting evokes the desired response, further instruction is indicated. This assistance of further instruction should take place through a process of scaffolding whereby the teacher models the learning task or activity and then carefully and systematically relinquishes more and more responsibility to the student to perform it (Moll, 1992). Corrective Feedback. Providing corrective feedback and reinforcement is done whenever the teacher has made an assessment of student learning at any point in the lesson. Perkins (1992) suggested that corrective feedback is one of the most important instructional activities provided during instruction. Walberg (1986), in his meta-analysis of research on teaching, found that providing corrective feedback and reinforcement showed the strongest relationship to student achievement of any single teacher action studied. Feedback should be provided for both correct and incorrect responses. An important principle is that students should not only hear or see the correct answers; they should also know why a particular answer is correct or incorrect. Dihoff, Brosvic, Epstein, and Cook (2004) showed that immediate feedback is superior to delayed feedback and the teacher should strive to provide feedback as quickly as possible. The relationship of reinforcement during instruction to academic achievement has been one of the most consistent findings in process-product research (Brophy & Good, 1986; Roseshine, 1995; Walberg & Paik, 2000). The most common form of such reinforcement is teacher attention: a nod, a smile, or a quick comment. Cheery notes on the assignment or stickers can be used effectively. Making a practice of sending a positive note home to parents or caregivers for at least one student in subject area or class period is an excellent way to provide reinforcement for quality work. Methods used are the same as the General Model, but differ in terms of the specificity of teacher statements and student responses. Scripted lessons present smaller amounts of new information and skill training in each lesson, often accounting for only 10 to 15% of the total lesson (S. Engelmann, 1999). The remainder of the lesson firms and reviews content presented in earlier lessons. As in the general model, a scripted lesson approach assumes that nothing is completely taught in a single lesson. Instead, new content is presented in parts of two or three consecutive lessons to provide students with enough exposure so they are able to use it in applications. Each lesson presents content that is new today; content that is being firmed, having been presented in the last two or three lessons; and content that was presented even earlier in the sequence and is assumed to be thoroughly mastered. This content often takes the form of problems or applications that require earlier-taught content (S. Engelmann, 1999). Thus, scripted lesson approaches could potentially utilize more allocated class time than other approaches to address learning objectives. While a scripted lesson approach was originally developed as a method to help predominately impoverished children who were not academically successful in traditional public school programs, it has been shown to be effective and efficient with both low and high performing students (Adams & Engelmann, 1996). In Project Follow Through, this scripted-lesson approach was compared to eight other models of instruction (including traditional and constructivist approaches and a home-based model) on outcome measures of three dimensions: academic basic skills, cognition, and affect (Stallings & Kaskowitz, 1974). The scripted-lesson approach produced the highest average performance of any program in all three dimensions (Watkins, 1988). In an analysis of Project Follow Through, Watkins (1988) found that there was an increased emphasis on mastery of content and skill prerequisites for additional lessons for all students. The analysis also indicated that a high degree of student success helped raise students' self-efficacy and, indirectly, improved the students' satisfaction with their schooling. Gersten, Taylor, and Graves (1999) assert that an emphasis on detail sets a scripted lesson approach apart from the general model. 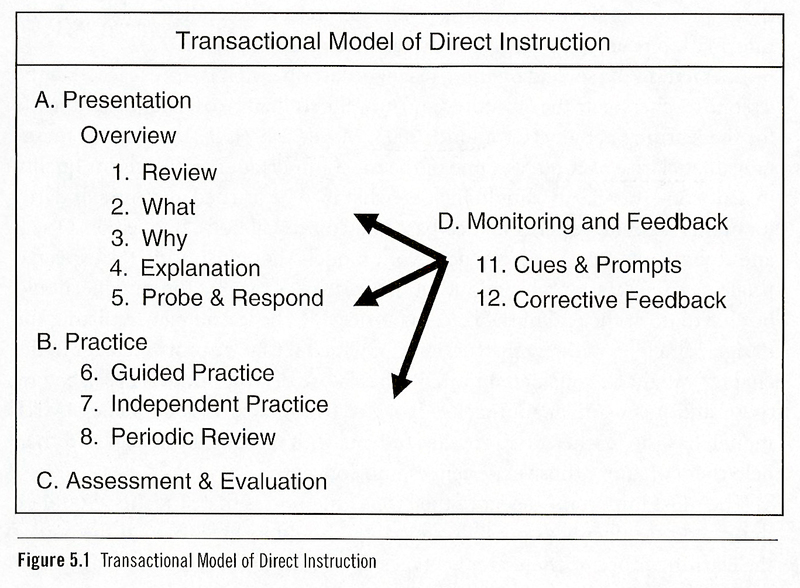 The scripted lesson approach shares many similarities with the general model of direct instruction. Scripted lessons begin with outcome behaviors being identified and then aligned with national or state curricular standards. The responsibility for this identification and alignment rests with the party (the individual teacher, a group of teachers, or a commercially available program) who generated the scripted lesson(s). These identified and aligned outcomes are then thoroughly "task analyzed." This involves breaking the complex skill or concept specified in the outcome into its component parts so that every student in a particular track has background skills and knowledge to learn the new skills and content. The scripted lesson approach differs from the general model in that: (1) the scripted lesson approach often involves a more detailed analysis, producing smaller steps in the task analysis than might be used in the general model; and (2) in scripted lessons, the exact wording the teacher and student use is written down. Problem-Based Learning (PBL) is a teaching method originally developed by Howard Barrows to teach problem-solving techniques to students of clinical medicine. Problem-based instruction (PBI) is rooted in experience-based education. Research and theory on learning suggest that by having students learn through the experience of solving problems, they can learn both content and thinking strategies. PBI is facilitated problem solving where student learning is organized around a complex problem that does not have a single solution. PBI typically starts with the presentation of the problem rather than a lecture or reading assignment intended to impart discipline-specific knowledge to the student. Students engage with the problem, generate ideas and possible solutions, determine what they currently know and do not know, establish learning goals, conduct research to acquire knowledge and skills needed to develop a viable solution to the problem, reflect on the problem utilizing the new information, and reflect on their problem-solving process (Savery & Duffy, 1995). As the learners work through the hypothetical-deductive reasoning process, the tutor provides support for their learning and their development of metacognitive skills. PBI is sometimes confused with a case-based approach. While there are several similarities between a problem-based approach and case-based approach, there are significant differences, as clearly explicated by Williams (1992). The fundamental difference lies in the purpose of the instruction. If the tenet it to provide vivid and complex exemplars that assist the learner in forming conceptual relationships that may be abstract, then the well-written cases are an excellent vehicle. A well-structured case study will include critical information needed to arrive at a predetermined conclusion. With most case studies there is one right answer and the learning task for the student is to pick up on all the clues that are important (and avoid the red herrings). A problem-based approach is different in that the nature of the problem selected is clearly less defined-part of the task for the learner is to refine the general problem into component parts-and the solution or range of solutions is not predetermined. By utilizing current resources, solutions to a problem can change over time. Research by Glaser (as cited by Resnick, 1989) suggests that both reasoning and learning are knowledge driven and, more specifically, that "Those who are knowledge-rich reason more profoundly. They elaborate as they study and thereby learn more effectively. Knowledge thus begets knowledge" (p. 2). Knowledge and experience are supported by research on problem solving as critical elements in effective problem analysis and the development of a viable solution (Jonassen, 2004). Cognitive flexibility theory (Spiro et al., 1991) suggests that using complex, messy, real-world problems helps students transfer the knowledge and skills they learn to future complex, real-world problems and learn to apply the knowledge and skills to novel or ill-structured problems (Jonassen, 1997). In a similar vein, Bransford, Brown, and Cocking (2000) identify PBI as a strategy to encourage transfer of learning between school and everyday life (p. 77). Situated cognition theory (Brown, Collins, & Duguid, 1989) identifies the importance to learning of ill-defined, authentic problems. Thus these three areas of learning theory collectively underscore the use of a problem-based approach. PBI has been adopted by different disciplines and, in the process, has been changed in both small and substantial ways to accommodate local conditions. This has led to some misapplications and misconceptions of PBI, and consequently certain practices that are still called PBI or PBL do not achieve the anticipated learning outcomes. Select problems that are authentic and fit within the curriculum for the discipline and encourage cross-discipline thinking. The role of the tutor is to support the development of the learner's metacognitive processing skills and the learner's expertise as a problem-solver. Use authentic assessment practices to validate the learning goals. Use consistent and thorough debriefing activities to consolidate key concepts learned from the experience. One common criticism of PBL is that students cannot really know what might be important for them to learn, especially in areas which they have no prior experience. Therefore teachers, as faciliators, must be careful to assess and account for the prior knowledge that students bring to the classroom. Another criticism is that a teacher adopting a PBL approach may not be able to cover as much material as a conventional lecture-based course. PBL can be very challenging to implement, as it requires a lot of planning and hard work for the teacher. It can be difficult at first for the teacher to “relinquish control” and become a facilitator, encouraging the students to ask the right questions rather than handing them solutions. Barrow, H. S. (1986). A taxonomy of problem-based learning methods. Medical Education, 20, 481-486. Savery, John R., Duffy, Thomas M. (1995). Problem based learning: An instructional model and its constructivist framework. Educational Technology 35(5), 31-38.